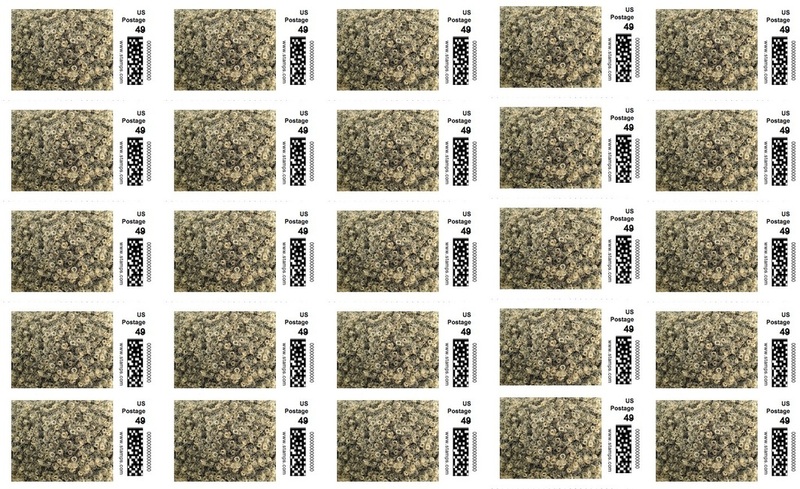 Claudia Rankine and John Lucas, untitled, 2017, two-cent stamps, dimensions variable. Here, she discusses her plans with artforum.com managing editor Lauren O’Neill-Butler. LAUREN O’NEILL-BUTLER: Where does the institute currently stand? Claudia Rankine: We have a curatorial team, which seemed to make sense since what we want to do is curate events. This team includes Casey Llewellyn, Beth Loffreda, Monica Youn, LeRonn Brooks, Meg Onli, Margo Okazawa-Rey, and Sara’o Bery. And we have an advisory board. Right now, we are getting ready to launch our website, which will be our online home. LOB: Will it be a roving, mobile space before you set down roots? CR: Yes, until we find the space. We have had a number of people offer space to us. It’s been lovely actually. Tilton Gallery and Howl Gallery down in the East Village. The Brooklyn Historical Society as well, for talks, and things like that. We are also partnering with the Institute of Contemporary Art at University of Pennsylvania. The rush to find a site is no longer as immediate because we’ve had people come forward. LOB: You mentioned that you want the institute to be among the galleries in Chelsea. CR: Yes, it’s still what we’re looking forward to doing, but it’s an expensive endeavor, so it’s a step at a time. LOB: Is is there an intention to appeal to people in the New York art world specifically? LOB: I’m imagining a visitor looking at Robert Ryman paintings, at Dia, for instance, and then maybe stepping into the institute to hear a dialogue on whiteness that could affect their perception of the whiteness of those works. CR: Exactly, so that you could have a framing. One of the things I love about Toyin Ojih Odutola’s paintings is that she is asking us to think about what it means to color a colored person or a black person or a white person. I went to her recent show at Jack Shainman and there was Prince Charles, in black pen and pencil, but still as presented as white as you remember him. How that whiteness traveled through this black surface was interesting to me. We are bombarded with images of whiteness all the time, but not framed as whiteness. Instead they are framed as normality, as American life, as suburban life, as extreme wealth, but never as this thing called whiteness. What does it mean to make work that has that conversation as part of its making? LOB: You’ve talked about going into an art bookstore and asking to see the books on whiteness, and no one could find them for you. LOB: But if you had said blackness he might have pulled out several books. CR: Exactly. That white thing: White people aren’t considered “white artists.” And that means that what they do is transcendent. This is art of the highest order. Yet, there are many books on whitenessby Richard Dyer, by Nell Painter, and more. 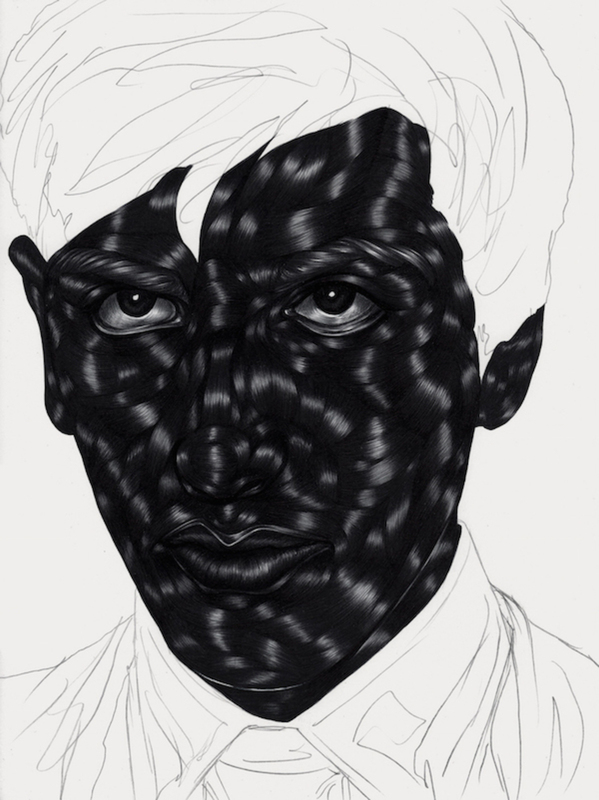 Toyin Ojih Odutola, The Treatment I, 2015, pen ink, gel ink, and pencil on paper. 12 x 9”. LOB: Whiteness is also being manipulated by the so-called “alt-right” as well. CR: The way American culture has made words like white supremacy, white dominance, and whiteness such a non-thing contributes to why there’s so much surprise about our new administration. Because now you actually have people in the administration who are white nationalists and no one knows what to do with that. The campaign to keep all of this silent and to transform it into a state of normalcy, rather than the state of whiteness, has worked. LOB: What would you say to someone who thinks this is intrinsic to capitalism? CR: It would make me feel better if I could think that this was really about the economy, or capitalism writ large. But I don’t think so. The KKK was real. It was formed immediately after the Civil Warimmediately. The black codes were real, and they were formed with the intent of keeping people of color out of the economy and destabilizing their ability to have any kind of normalcy in terms education, housing, and other aspects of their lives. So while I would like to believe the rhetoric around capitalism and the economy driving all of this, I just don’t. A good example is the people who are on the Affordable Care Act who say they want to keep it but who also want to get rid of “Obamacare.” They understand that the ACA is useful to them, but they don’t want anything that is proximate to blackness near them. That’s not about the economy. LOB: When did the institute begin for you? Around that time, I published Citizen. I had no idea that it would become such a public book. It meant that many things I was moving ahead with got put aside. And that lasted longer than I anticipated. Suddenly 2014 was 2016. But then things started to quiet down, relatively speaking. And then I thought, wait, this might be the time for us to start this again. It didn’t happen in response to Trump. Because Trump is not the beginning of this; he’s just a blatant manifestation of it. It was in the air for a long time. LOB: Is there a mission statement? Race is one of the prime ways history lives in us. Our name “racial imaginary” is meant to capture the enduring truth of race: It is an invented concept that nevertheless operates with extraordinary force in our daily lives, limiting our movements and imaginations. We understand that perceptions, resources, rights, and lives themselves flow along racial lines that confront some of us with restrictions and give others uninterrogated power. These lines are drawn and maintained by white dominance even as individuals and communities alike continually challenge them. LOB: What kind of shows are you envisioning? CR: We’re depending on the kindness of strangers. People are loaning work to us for the shows. At this point, we’re asking artists to make pieces for us with the considerations I just outlined in mind. We’ve also had many people come to us and say, “This is my work, it might be of interest to you.” Some of us are artists too so we are making work thinking about it. I can show you a piece that I’m working on. I’ve been trying to think of a thing in our culture that we all partake in, and yet which always lands in the same place. For me, blondeness is one of these things. The minute you think blonde, you’re going to think white. Even if you see it as freedom, if you see it as beauty, if you see if as youth, it creates its own lexicon around whitenessso whiteness is freedom, whiteness is beauty, whiteness is youth, whiteness is desirability. I’m also fascinated by blondeness as something that is used in white supremacy as a signal of purity, but now it’s been taken up by everyone, and in a way that doesn’t even pretend to suggest that I was born this way. And so I made these stamps. We’re going to start mailing them out. And I hope this is what artists will dothink about extending their practice in a way that is in dialogue with how whiteness functions in the culture. LOB: The institute’s audience is everyone. CR: Yes, and if that weren’t the case then I could have stayed in academia. It was the academic institutions that created the false histories, language, and science around whiteness, race, and blackness. That allowed the justification of dehumanizing and killing populations. Even when it was then debunked as fabricated, it didn’t matter. It was already in the water. And that was that. Sometimes people ask me, “Why aren’t you angry with white people?” But I think it’s not individuals. It’s the culture itself. People are born into this. I also think that people believe in their goodness and they think they’re good people. They don’t identify as a community of whiteness because that’s part of how whiteness is constructed. White people are individuals. They don’t belong to the community of whiteness. So to speak about a community of whiteness is appalling to them because they’re individuals, they’re good people. There’s a fantastic critic named Robin DiAngelo. She’s responsible for the phrase “white fragility,” which is the sense that people are so sensitive to being called out that their responses will go everywhere from tears to murder. She says that what white people should do is begin from the place where they know they’re racist. That is, if white people could just accept the fact that they’re racist because they’re part of a racist culture, and that they belong to a group that has been bred on internalized dominancethat’s her phrasethen we could start to have actual discussions about what’s going on. View whiteness, inc., an artist's project by Claudia Rankine and John Lucas in Artforum’s Summer 2016 issue here.